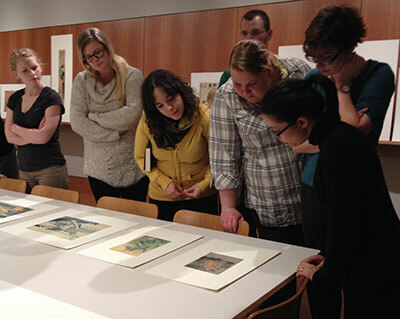 Visiting Assistant Professor Hilary Snow’s ARTHIST 770: Colloquium in Non-Western Art: Japanese Print Culture visited the Chazen Museum of Art at UW-Madison on Tuesday, November 11 to view Japanese prints. Drew Stevens, Curator of Prints, Drawings, and Photographs, led a lively discussion of ukiyo-e prints. Students were able to carefully examine multiple impressions of the same design and learned some of the ways to tell an early version from a later one.